The ninth annual Veuve Clicquot Polo Classic kicks off Polo Weekend on Oct. 4 at the Intercontinental Los Angeles Downtown. In the evening, the high-rise will light up in Clicquot yellow and will feature a live DJ, signature Polo Eve cocktail, selection of Veuve Clicquot Champagnes and cityscape views of the Pacific Ocean to the Hollywood sign and beyond. This event opens at 4 p.m. to the public with a free entry before 8 p.m. There is a $25 nightly cover charge after 8 p.m. 900 Wilshire Blvd., (213)688-7777. A.O.C. is back in business after a small kitchen fire. Enjoy once again the restaurant’s California-focused small plates created by the award-winning chef and restaurateur duo of Suzanne Goin and the 2018 James Beard Foundation honoree Caroline Styne. 8700 W. Third St., Los Angeles, (310)859-9859. Starting Saturday, Oct. 6, at 10 a.m., Brennan’s in Marina del Rey will throw an Oktoberfest party with beer, sausages, lederhosen and live music. Brennan’s has partnered with Weihenstephaner for beer on tap, and Jägermeister, Underberg, Tito’s and Jameson for liquor. The kickoff begins with a horn-blowing ceremony and a hula hoop dance show by Tika Moini. Other entertainment includes potato sack racing, stein holding contest, beer pong, bratwurst eating competition, best traditional outfit contest and a photo booth. Entry before noon is free, but there’s a $5 cover afterwards. Food includes roasted turkey leg, German potato salad with beer-braised sausage and sauerkraut, brats and pretzels. The VIP package includes a stein, discounts on beer, and two food tickets for $25. Large group packages include a dedicated space with 10 seats, 10 steins, 10 discount wristbands, 20 food tickets and 10 shirts for $200. Space is limited. Email info@brennansla.com, or visit bit.ly/2zL1W8N. 4089 Lincoln Blvd., (424)443-5119. On Oct. 6, executive chef Mohan Ismail will serve noodle dishes with influences from Thailand, Vietnam, Malaysia, Singapore, Indonesia and India. Try the Hokkien noodles made with shrimp, calamari, egg noodles, bok choy, egg, garlic and spicy shrimp sambal, or the Singapore Nyonya laksa made with shrimp, golden noodles, egg, bean sprouts, jicama, cilantro with spicy chili paste. Ismail’s noodles with wok-fried vegetables, which include snow peas, carrots, shiitake mushrooms, chilies, bean sprouts, cilantro and fried shallots, are also delicious. 10250 Santa Monica Blvd., Los Angeles, (310)552-9988. Every Thursday, SRC restaurants Castaway in Burbank and Whiskey Red’s will offer Dave’s margaritas for 60 cents starting on Oct. 11. This special drink is available with purchase of an entrée or appetizer, and is limited to two per person. The drink pays tribute to SRC’s founder and World War II veteran, David Tallichet, and his favorite drink. SRC is currently run by Tallichet’s son, John. Castaway, 1250 E. Harvard Road, (818)848-6691; Whiskey Red’s, 13813 Fiji Way, Marina del Rey. (310)823-4522. Artisanal Brewers Collective’s Broxton opens on Sunday, Oct. 7, near UCLA. This new brewery and public house, in the historic Janss Dome Building, offers fresh beer brewed on site. Broxton updates the classic “meat and three” concept for diners. Pick one protein, two sides and a biscuit – there are plenty of vegan options, as well as comfort food staples such as a mac and cheese skillet, a buttermilk chicken sandwich and The Big Mohawk made with double-stacked Impossible meat patties. 1099 Westwood Blvd., Los Angeles, (310)261-2919. On Tuesday, Oct. 9, Connie and Ted’s along with wine importers Broadbent Selections will offer a $95 pre-fixe dinner menu sampling the wines of Portugal. Chef Sam Baxter will offer a four-course menu to complement the wines and showcase the Portuguese influence in New England cuisine. There are three seating times available at 6 p.m., 7 p.m. and 8 p.m. 8171 Santa Monica Blvd., West Hollywood, (323)848-2722. On Thursday, Oct. 11, guest chef Michele Lisi, of Nerano, will prepare a five-course tasting menu paired by Toscana’s wine director Roberto Facciolla with Beniamino and Alberto D’Agostino, the owners of Botromagno Vigneti & Cantine. Pricing for Toscana’s Botromagno wine dinner is $85 per person, excluding tax and gratuity. Dinner will begin promptly at 7 p.m. Advance reservations are required and seating availability is limited for this event. Reservations may be made by calling Toscana between the hours of 10 a.m. to 4 p.m. 11633 San Vicente Blvd., #100A, Los Angeles, (310)820-2448. The annual culinary tour Taste America returns to Los Angeles for its sixth year on Friday, Oct. 12, at 6 p.m. at SLS Hotel, Beverly Hills. 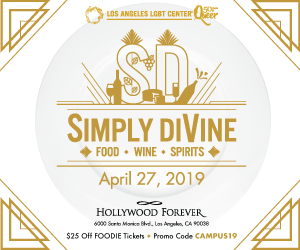 This year, chef Curtis Stone hosts a dazzling evening featuring some of Los Angeles’ top chefs with a one-of-a-kind, collaborative three-course dinner prepared by Andrew Carmellini, of The Dutch in New York City, and Ludo Lefebvre, of Trois Mec in Los Angeles. The event will also feature chefs Wes Avila, of Guerilla Tacos; Raphael Francois, of Tesse; Pawan Mahendro, of Badmaash; and Mei Lin, of Nightshade. In addition to spotlighting delicious food, Taste America focuses on amplifying the James Beard Foundation’s food waste and sustainability initiatives, and will directly contribute to the foundation’s scholarship programs. This benefit dinner will be co-chaired by Robert Schueller, director of public relations for Melissa’s Produce, and Mary Sue Milliken, of Border Grill and the James Beard Foundation board of trustees. For tickets, contact kelsey@afandco.com. 465 La Cienega Blvd., (415)781-5700. Now through Oct. 31, the upstairs bar area of Nerano will host Industry Nights for those working in Beverly Hills or Century City. Show your business card at BG Lounge and receive 50 percent off all drinks Mondays through Thursdays from 7 to 9 p.m. Southern Italian-inspired bites will be offered during happy hour from 4:30 to 7 p.m. 9960 S. Santa Monica Blvd., Beverly Hills, (310)405-0155. Nautical seafood hotspot Laurel Point has launched a new happy hour known as “Low Tide.” Guests can now enjoy specialty seafood snacks such as barbecue oysters with chipotle bourbon butter, buffalo shrimp popcorn with blue cheese dip, or a lobster pot pie with puff pastry and sherry cream. The menu also features $5 draft beers and craft cocktails that include the geisha martini for $9. “Low Tide” is offered Monday through Friday from 3:30 to 6:30 p.m. 12050 Ventura Blvd., Studio City, (818)769-6336. Executive chef Duke Gervais offers a fun pizza program in Little Tokyo. Unexpected pizzas are topped with tender baby octopus or chicken and strawberries. Baldoria also accommodates diners with dietary restrictions by offering a choice of gluten-free crust or vegan cheese on any of the signature pizzas. For pizza aficionados, attend Gervais’ intimate pizza-making classes for $30 per person. These classes are offered three Sundays per month. Guests create their own pizza combination in the kitchen with Gervais while sipping on a complimentary glass of beer or wine. On the weekends, Baldoria offers a value prix-fixe menu that includes an entrée or pizza, one side dish, and a bottomless mimosa or rosé from 11 a.m. to 4 p.m. 243 S. San Pedro St., (213)947-3329.